Radical homemakers and TCYOF blew up my brain too! Simplicity parenting did more lasting “damage” than “Unconditional Parenting” personally, but it’s still such a great book! Siddartha by Herman Hesse was the first book I remember reading that I needed a point to collect myself afterwards. I wonder if it makes a difference, what order you read them in? I read Unconditional Parenting first, so I think that’s why it had a bigger impact than Simplicity Parenting. Maybe it would have been different, had I read them in reverse order. Which one did you read first? Hmm. The one book that greatly altered the course of my life is the Book of Concord. A book of confessions of the Lutheran church. It is heady stuff but really impacted me in college and is the reason I became a Lutheran. *the original language uses the term “catholic” but it was written at a time in history BEFORE the Roman Catholic Church existed as a denomination and this named. Back when the Apostle’s Creed was written, the term “catholic” simply meant “universal.” Due to this, many groups today use the term “Christian” when translating the creed as it conveys the original meaning without confusion about denominations. Thanks, Michele. Interesting about the Book of Concord! And I sort of know what you mean about the NT Wright book — once I read it, I could see that the truth had been obvious all along. But the Evangelical church has gained incredible influence in North America (I believe Evanglicalism is the most prominent form of Christianity in North America, and has the loudest in the media), and they teach (in NO uncertain terms) that Christian souls immediately go to spend eternity in some disembodied heaven after death. Wright points to a lot of ambiguity from the Anglican church, too. There’s been a lot of confusion on the afterlife in general, despite quite a bit of clarity in the Bible. 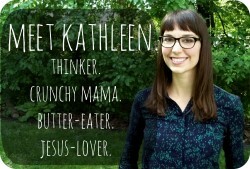 I agree Kathleen, as a child in a mainstream evangelical church the message I got (often implied, but still clear to me) was always that we should be so eager for heaven that we don’t really enjoy our time on this earth. I always struggled with this message, as I for the most part quite like it here. And I always felt incredibly guilty for not wanting to hurry up and get to heaven already. The follow-up was that we would eventually get new bodies, but that effectively God would blow up this earth and make a new one. It wasn’t until we started attending our current church (part of MCC) that the concept of God’s kingdom on this earth really came across. I finally felt like I had permission to enjoy this place, and the wonders of God’s creation. And furthermore, that we have a role to play in bringing the kingdom here. I have long been a “hippie” and I struggled a lot with the idea that “dominion” gives us carte blanch to do whatever we want with God’s creation (which was the de facto message I received from mainstream evangelicalism). I haven’t read this book so I’m not sure if this point is brought up at all, but for me I think the subtle difference in those two concepts have a profound effect on how we approach life and God’s creation. Believing that God will basically just start over significantly reduces our stake in and incentive to love and protect this earth. Whereas, if you believe we are co-creators with God in ushering in his kingdom on this earth you begin to see it as home, and it’s harm and destruction take on a whole new meaning. Love all your thoughts here, Lily! “I finally felt like I had permission to enjoy this place.” YES! And Wright does address a lot of these ideas. The idea that this earth is good and that it will be our home forever definitely encourages me to take better care of it. This is a great list! I want to read all these books – and happily I have just borrowed Nourishing Traditions from my local library. PS I have been a lurker on your blog ever since Project M. I love the perspective you bring to marriage and family – it has led me to make changes to my life. Thank you for all you do. Aw, thanks, Evangeline! Thanks so much for introducing yourself! Feelings Buried Alive Never Die by Karol Truman really changed the way I see health and wellness. It helped me to realize how interconnected our emotional and physical selves are. I’d always thought that to take care of my physical body I just needed to do physical things, but now I better understand the importance of taking care of my whole self. Interesting, Sandy! I’ve never heard of that book — sounds fascinating! Irresistible Revolution also blew up my brain. The same summer I read that, the older book “Christianity Rediscovered” by Vincent Donovan also blew my mind (missionary to tribal people asking what the gospel looks like without Western trappings). A few years later, “Jesus for President” by Claibourne/Haw blew up my brain about empire, politics, military, and the gospel. “Creating Health: Honoring Women’s Wisdom” by Christiane Northrup and “Love, Medicine, and Miracles” by Dr. Bernie Siegel both blew up my brain about the mind/body connection and how to approach health, healing, and disease. “A General Theory of Love” is about neuroscience, and blew up my brain about human attachment, and single-handedly convinced me that of the importance of staying at home with children under 2. I, too, count Radical Homemakers as a favorite. Nourishing Traditions continues to blow up my brain. Shane Claiborne’s Irresistible Revolution should be a must read for anyone that wants to take their Christianity out of the pews. 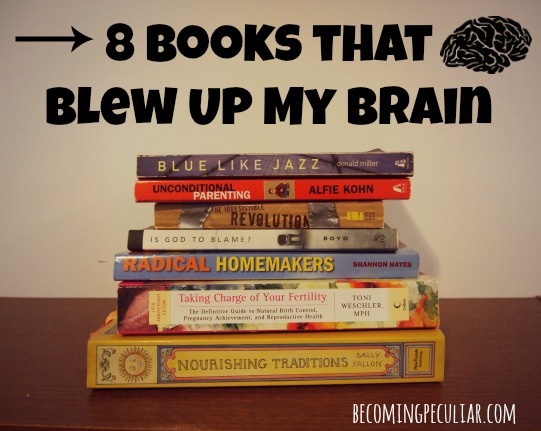 It “blew up my brain” also. I have met Shane and he is as real as it gets. What you see in the book is what you see when you meet him. His attitude “Jesus meant the things he said is a vary Anabaptist position. I have one of Greg Boyd’s books as well and upon your recommendation I believe “Is God to Blame….” will be a future purchase. I’m years late to the conversation, but “Irresistible Revolution,” completely changed my life. I’m an attorney (who has always gone the public interest route) and the book was recommended to me by a big firm attorney who, after interviewing me, told me that he could see that big law was not for me. I’ve since read it twice and have “stalked” Shane Claiborne and his friends ever since. I’ve read Blue Like Jazz and I really enjoyed the read, but it didn’t change my life. I think I was already there by the time I read the book..
I’m heading to the library today to pick up Surprised by Hope and plan to get through the other books on this list over the next few weeks. Thanks for the recommendations!